Its the sudden fatigue that he notices first- there was no sign of it as he was flying down the hill but as he looks to traverse this 500m incline, he begins to slow down half-way. He slows down and starts walking after a while- he keeps telling himself that he just wants a glimpse. Its been so long since he visited, there was a time when he would go at least once a week. He walks by the rows of seedy stores and reaches a row of apartments and wonders if he is lost and just as he is thinking that, he sees it. The expanding blue fogged up in the distance. He involuntarily breaks into a smile. He can walk quicker now. He finds a spot next to a rock on the beach and looks at the surfers on their boards in the water riding the waves and wonders about why we want to conquer everything we come across- waves, the space, the people. He digs in the sand distracted only to find a 20cent coin. His fingers twirl the coin as he walks absent-mindedly away from the water. The boy steps into the bus- he is about 5 foot 4 inches. His face is pockmarked with pimples that are typical of his age. A virgin moustache completes his adolescent look. The middle-aged couple sitting in front of the bus stare at his skull-cap. Its an appraising stare that seems to indicate their disapproval with his expression of faith. The boy looks around casually at the back of the bus only to drag his eyes towards the middle where four teenage girls sit. There is a casual locking of glances with one of the girls and he looks back in the front. Suddenly his phone rings and the ring-tone sounds like a group of protesters- the girls break out in giggles and he stiffens up knowing he has their attention. The couple stare at the scene with a bemused expression imagining their good-old days. Its a cold morning. He can hear the howling of the wind through the bathroom windows. He stands looking at himself in the mirror and notices the first wisps of white in his mop of hair. He grins toothily and completes his ablutions. He puts on his singlet and tapes his number to his singlet. Suddenly he realises that it might be hard to put the timing chip on his shoelaces. He struggles with it a bit before managing to fix it to his shoe. He puts on his hooded sweatshirt and heads out. Its dark and yet there is a sharpness in the air that instantly wakes him up. Its like a blast of cold water. The bus-ride to the starting point is uneventful. By 7:15am, there are about 6000 runners lined up. He looks around to see people of different shapes, sizes and fitness levels and realises how unprepared he is. He hopes he doesn't injure himself over the 21.1 km distance and can complete the race. 7:30 am and the race kicks off. He knows he is running faster than he should be and yet the momentum of the runners carries him for the first 10 kms which he completes in 58 minutes. 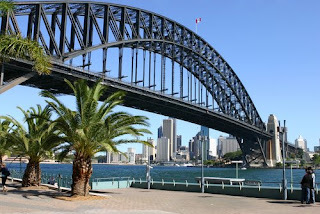 He passes by the Harbour bridge and looks at the Sydney Theatre Company and momentarily thinks of a past life. 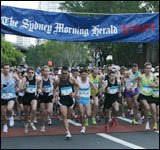 The sun is just coming up over the Sydney harbour and he knows that the first lap will be the easy one. Lap one done he walks for a couple of minutes before kicking into the next 10kms. Its at the 15km mark that the first twinge sets in. His knees have never known this kind of distance. He asks himself why 7000 completely sane people decide to get up on a cold Sunday morning and decide to run 21 kms. Its the last 3 kms and he is struggling and suddenly its the last stretch. Its amazing what cheering people on the sidelines of the road do to a sore knee and ankles. He sprints towards the end and finishes in 131 minutes. He stands there in pain and exhaustion- slightly disappointed that he did not achieve the time he had hoped for and yet ecstatic that he had stepped up a notch in his attempt at long-distance running. His legs are screaming and his thighs are chaffed and yet he runs his fingers along the medal feeling lighter and happier. He realises the answer to his question of why 7000 people would want to do this- fighting an opponent is easy as is done in other sports however running has probably more fighting oneself than any other sport. Its that battle that he wants to win and today- he did! The elderly gentleman is about 70 years old. He is dressed in a white T-shirt and white shorts with a white hat. A pair of glasses complete the picture for Mr. A. He lumbers around on the tennis court as he plays Mixed doubles with his daughter. The game over they walk out having been trounced 6-0 by the opposite side. He is not expecting too much and is out to have an outing on a beautiful sunny day. He looks onto the courts and sighs looking at some of the younger players hitting winners and coming up with some brilliant volleys. He has the next game with the latest youngster on the team. They introduce themselves to each other- their backgrounds are vastly diverse as they head onto the court. Their opponents are a couple of 20 year-olds. The game starts and its a game of one set. In no time, Mr. A and the newbie find themselves down 4-0. Mr. A thinks its going to be like just another game of all the games he has been a part of. He moves slowly across the court and is now unable to cover his side of the court. The fifth game starts and the newbie serves at deuce and the deuce goes on to 9-8 before the he closes it out with an ace. They exchange a pleasantry and suddenly there is a different dynamic on the court. They win the next two games and suddenly they find themselves at 4-4. They look at each other with incredulity which defines the situation. Suddenly its like Mr. A feeds off the newbie's energy and keeps the ball in play. The newbie covers the courts from length-to-length protecting Mr. A's domain and eventually they are up 5-4 and looking to close the set out. Their opponents are stunned by the turn the game takes and are now struggling to stay alive. The opponent commits a double-fault and suddenly its over. They win 6 games in a row and there is a child-like joy in the two. They shake hands and suddenly Mr. A has a smile that stretches a mile. The newbie walks out amazed at what happens when you refuse to give up. Lets hope this is the start of many more such journeys. Next post about the travel!